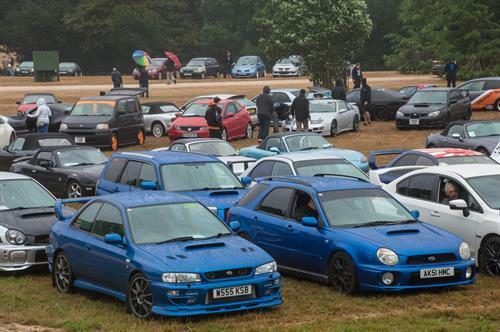 947 Japanese cars of every variety joined Beaulieu’s Simply Japanese on Sunday July 29th, as 2099 rally participants shrugged off rainy weather to celebrate the machines from the land of the rising sun The varied display in the grounds of the National Motor Museum spanned all manner of Japanese car marques, including Mazda, Subaru, Honda, Mitsubishi, Lexus, Toyota, Nissan and more. From high-performance sports cars and showroom-fresh models, to city runabouts and rare classics, there was something to please every Japanese car fan. Throughout the day, show-goers voted for their favourite car of the show in the People’s Choice Award. The winner was Kyle Miller from Hayling Island with his modified 1990 Mazda MX-5. Although he had only owned it for one year, Kyle had worked hard to transform the car into his ideal MX-5. “I’ve done a lot of work to the car, as it was green with a beige interior when I bought it. I love the new grey paintwork and black upholstery, while I also converted it from an automatic to a manual gearbox and fitted air suspension,” said Kyle. He was presented with a trophy and an Autoglym car care pack by Beaulieu’s Financial Director Phil Johnson. Runners up in the People’s Choice Awards were Kevin Curtis from Holbury and Savontharam Jeganathan from Gosport. Kevin’s 1981 Datsun Bluebird GL was an incredibly original example of a rarely-seen saloon. “I got in touch with the car’s first owner listed on the logbook, who sent me all of the car’s original paperwork, including old warranty certificates and tax discs,” said Kevin. Savontharam’s 2008 Nissan GT-R was a recent import from Japan, with its carbon fibre bodywork making it significantly lighter than standard. Both runners up were presented with special Autogylm prizes. Club stands were at the heart of the show, with the Celica Club showcasing different incarnations of the popular Toyota Celica coupe, while a selection of Nissan ‘Z’ sports cars could be found on the Z Club of Great Britain stand. The Mazda Bongo Owners’ Club turned out in force with an impressive line-up of these popular campers, while the Herts Scooby Crewparked up in their Subarus. Other Japanese cars on show ranged from coveted Mitsubishi Evolution sports saloons and eye-catching Nissan Cubes and Figaros, to classics such as a luxurious 1973 Toyota Crown 2600 and a first generation Mazda RX-7 in yellow and red racing colours.